A visit by Saudi Crown Prince Mohammad bin Salman on Tuesday to Islam’s holiest site in Mecca sparked outrage on social media, following the recent uproar over the royal’s role in the murder of journalist Jamal Khashoggi and atrocities committed in the Yemen war. 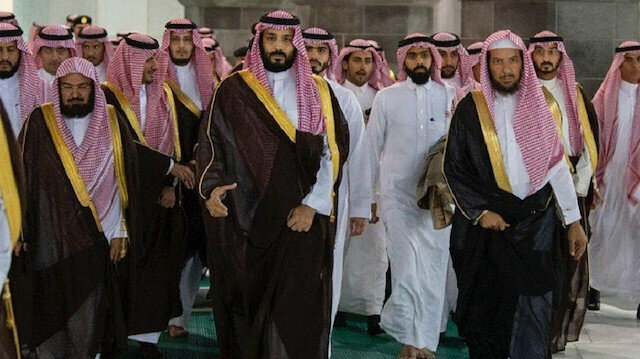 Several photos showed bin Salman touring holy sites in Mecca, including the Kaaba, along with his large entourage. One video shows the crown prince on the roof of the Kaaba accompanied by other officials. According to Saudi reports, bin Salman was briefed on an expansion project during his unannounced visit to Mecca. In several of the photos, he can also be seen praying inside the Kaaba and performing the traditional washing of the holy site. A video that went viral on Twitter showed hundreds of soldiers blocking worshippers from approaching the Kaaba as bin Salman toured the holy site, prompting many to question why the crown prince needs “heavy protection” while visiting the Kaaba. After saying he had left the consulate alive, Saudi Arabia admitted weeks later that Khashoggi – a columnist for The Washington Post - was killed there, blaming his death on a group of rogue Saudi operatives. Saudi Arabia’s efforts to cover up the case of slain journalist Khashoggi case further unraveled this week, according to The New York Times. The latest demands for a reckoning “have come from American intelligence agencies, a United Nations investigator and a coalition of nongovernmental organizations, sources that in their diversity and breadth should serve notice on [Saudi Crown] Prince Mohammed [bin Salman] that all his oil wealth and powerful friends will not wash away the blood of the slain journalist,” the paper said in its lead editorial on Friday.